Rise & Fall: Civilizations at War is probably the most unique and entertaining real-time strategy game since its concept in the early days with Red Alert and Warcraft. 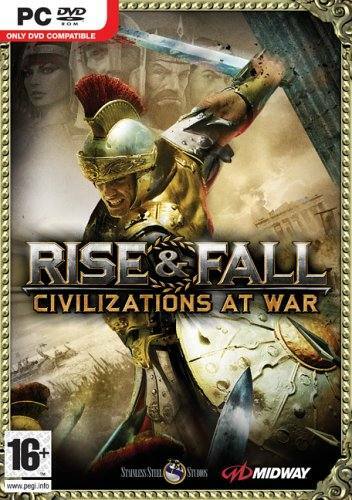 The developers of Rise & Fall: Civilizations at War, Stainless Steel Studios have really rewritten the genre in what promises gamers one of the most thrilling and realistic strategy games of the year which takes the gamer to antiquity with four powerful nations that include Rome, Egypt, Persia and Greece. Engage in awe-inspiring feats of heroism by joining troops during epic fights in third-person perspective, and personally turn the tide of battle! Control one of eight unique Heroes including Julius Caesar, Germanicus Caesar, Cleopatra, Ramses the Great, Nebuchadnezzar, Sargon, Achilles and Alexander the Great, each with their own unique abilities and weapons. 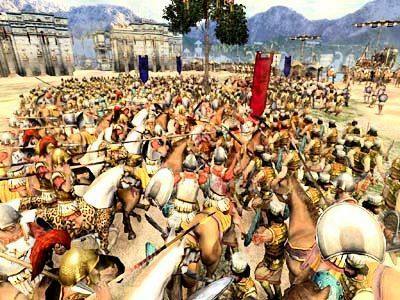 Choose from four of the ancient world's mightiest empires: Greece, Persia, Egypt or Rome. 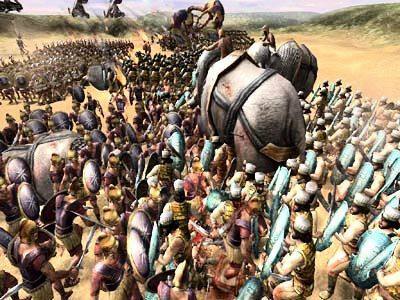 Enlist more than 80 unique units, including footmen, archers, cavalry, siege units and massive triremes. Use realistically-scaled siege towers, ladders, and battering rams to annihilate city defenses and clear the way for ground forces. Rule the seas and secure victory! Fight for control of the seas by boarding and ramming enemy naval vessels using massive, accurately-scaled warships. Recruit craftsman, scientists, artisans, and advisors who will help enhance civilizations both militarily and economically. Capture new territories and establish outposts to increase your recruiting ability and train new formations of soldiers rapidly. Up to 8 players will battle it out across numerous multiplayer game types and maps, waging all-out war on the seas, in the cities and down on the ground in Hero Mode. 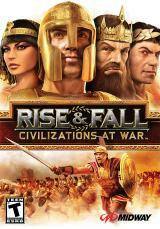 In its basic concept, Rise & Fall: Civilizations at War (Rise & Fall) is similar to the current strategy games on the market such as Empire Earth II or Age of Mythology that not only caters for the megalomaniac in all of us but also the strategist that has the player controlling one of these powerful and vast empires in an attempt to not only control their lands but also conquer their neighbors. 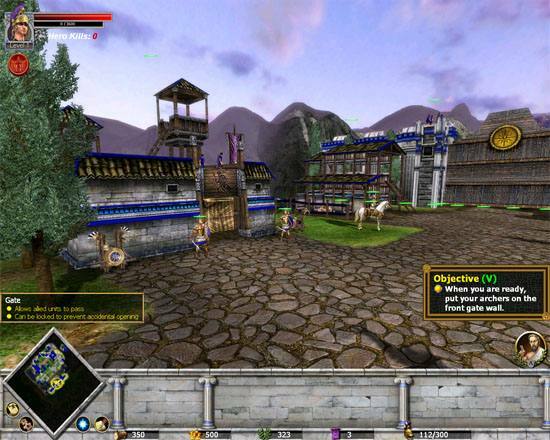 As with all good real-time strategy games, Rise & Fall transforms the gamer into the role of an all-mighty overseer that has them using all their skills in order to build a better empire by collecting the basics such as gold and wood in order to build their forces and solidify their presence within the region. The first step of mastering Rise & Fall is to master the micro-economy of the title by using your plebians to collect valuable timbre and precious gold. This currency is then used to create a vast range of units and buildings in order to strengthen your empire. With that said, territory is another resource that must be mastered in Rise & Fall because not only will this increase your main resources but it also leads you to victory. Another advantage of increasing your personal territories is that it also increases your troops but bare in mind, the larger your territory is, the more management and defense is also at stake. Rise & Fall also features hero units that although not only inspires your troops and people to work for your "better" cause but ironically it allows the gamer to actually fight with their troops in a third-person view. An interesting feature that I'm sure will give a unique spin on the genre. Not only do your heroes feature powerful and devastating attacks but they can also be used to sabotage your opponents strongholds by using their talents to sneak your way through enemy ranks and cities. Your heroes include historical greats that include Julius Caesar, Germanicus Caesar, Cleopatra, Ramses the Great and even Alexander the Great who each have their own unique abilities and weapons that truly makes this title one heck of a game. By successfully completing goals in the game, your heroes will also be awarded so-called "experience points" that allow the hero to unlock different weapons and upgrades in order to better their civilization. I must admit that heroes are an extremely important character in the game because in the right circumstances, these heroes can turn the tide of war by unleashing their devastating attacks on the enemy which not only cuts through their ranks but also provides your own troops with a road to victory. Heroes also dictate the advisors the player has access to and as heroes become more and more powerful, so will the advisors that not only assist their own civilization but also the technologies that your culture has access to. Although it should also be noted that advisors may not always give the best advance which I have learned through my follies, heeding one of my advisors advice to rush into a battle that was unfortunately lost. One of the most impressive features of Rise & Fall is the naval combat aspect of the game that unlike traditional real-time strategy games which have ships pitted against other ships, your crew now plays a vital role in how the battles are played. For instance, your soldiers can now grapple enemy vessels in order to board their crafts while your archers rain deadly fire upon their heathen carcasses. Even the small things have been successfully implemented into this title such as the beat of the war drums that are used to assist your units in successfully ramming other ships which are sometimes missed in many games of such high caliber. The battles of Rise & Fall although it will take some novice gamers a little getting use to, the more professional gamer will have no problems in mastering the control system of this title. Highlighting units (either single or multiple) allows the player to control their directions but interestingly enough, you can also combine different squads in order to challenge your enemies. 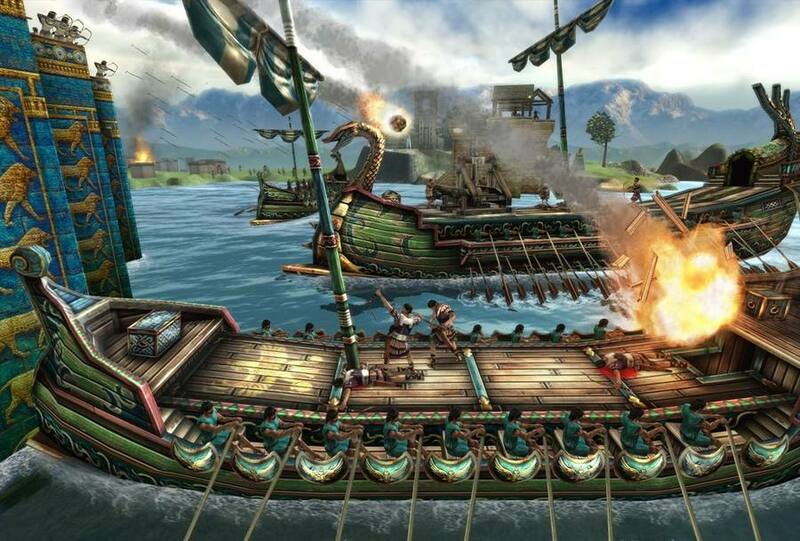 The number of different units that are available to player are insane and include your traditional troops such as cavalry, archers and swordsmen, you also have access to other units such as elephants and equipment such as war boats. Graphically, Rise & Fall is a visual masterpiece on the PC (provided you have the recommended setup) features a 3D environment that actually immerses the player into these ancient civilizations. Stainless Steel Studios have created just about every aspect of these ancient cultures and when you see ancient Egypt or Greece, you actually get the feeling that this is what it might have looked those many millennium ago. Apart from amazing background environments, the game also contains some realistic characters that all move with a human-like grace which all have their own unique characteristics. Match that with some realistic texture detail, especially for the heroes in the game and you easily have one of the best looking real-time strategy titles to date. The small touches to detail such as the individual blades of grass of the moving of the trees is a nice progression of how the graphics have improved since the beginning of real-time strategy games on the computer. It should also be noted that Rise & Fall contains some realistic special effects from explosions, shadows, lighting and realistic cloud effects that all go hand-in-hand with the gameplay. Trees, wildlife and civilians are also those small touches that really make you appreciate the game. In conclusion, Stainless Steel Studios with the assistance of Midway have released what is destined to be the game of 2006 with its new take on real-time strategies that now immerses the gamer into the worlds of ancient Egypt, Rome, Greece and Persia. With first class graphics, enriching, exciting and addictive gameplay and the sounds of these ancient battles, Rise and Fall: Civilizations at War comes highly recommended and if there is only one strategy game you buy each year, then this title is it! Video Card: 64MB VRAM minimum. Directx 9.0b compatible, including the following: ATI 8500, All-In-Wonder 8500, 9000, 9200, 9500, 9600, 9700, 9800, X300, X600, X800. NVidia Quadro, Quadro 2, Quadro 4 series, GeForce 3, 3Ti, GeForce 4, 4Ti, Geforce FX 5200, 5600, 5700, 5800, 5900, 5950, 6600, 6800. Sound: DirectX 9.0c compliant sound card.